President Muhammadu Buhari on Monday engaged in a series of meetings with some former leaders of the National Assembly at the Presidential Villa, Abuja. Some of those who met with the President behind closed doors were two former Presidents of the Senate, David Mark and Ken Nnamani as well as a former Speaker of the House of Representatives, Aminu Masari. The Senior Special Assistant to the President on National Assembly Matters (Senate), Ita Enang, who is a former Senator was also at the Presidential Villa. Nnamani and Masari arrived for the meeting at the same time while Mark and Enang arrived a few minutes later. It was not clear if the four of them met with the President at the same time or they met with him separately the way they came. Nnamani and Masari apparently avoided State House correspondents as they were said to have been driven out of the President’s office through the Service Chiefs’ Gate after the meeting. Mark who left after spending about 40 minutes in the President’s office also did not talk to reporters. The agenda of the meetings was not made public. As of the time of filing this report, no statement had been issued on the meetings. Monday was the first time Mark who belongs to the opposition Peoples Democratic Party would be sighted inside the Presidential Villa since the inception of the present administration. He was reported to have played a key role in dousing the tension said to have been generated during the executive session of the Senate last week when some lawmakers reportedly asked for the commencement of impeachment process against the President. 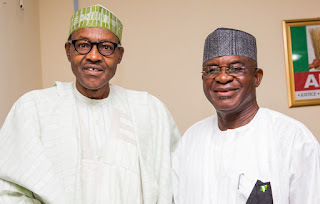 Unconfirmed reports said the meetings of the former presiding officers of the National Assembly with the President were not unconnected with moves to end the current animosity between the Executive and Legislature. There has been a face-off between the two arms of government since court cases were instituted against the President of the Senate, Bukola Saraki. Saraki is currently standing trial before the Code of Conduct Tribunal for alleged false declaration of assets. Lately, he and his deputy, Ike Ekweremadu, were also dragged to court for alleged forgery of the Senate Standing Rule.